Be the first to share your favorite memory, photo or story of Bernistein. This memorial page is dedicated for family, friends and future generations to celebrate the life of their loved one. Abilene - Bernistein Tate was born in Fort Worth, Texas to Jab and Maude Davis on August 9, 1924. She attended IM Terrell High School top in her class. She then worked as a waitress when she met the love of her life, Henry Tate, Sr. They later married and had five lovely children. The family later moved to Breckenridge and she took a job as a housekeeper. As time passed, she started working as a dietician at Stephens Memorial Hospital. While working she decided to be an LVN and attended college in Graham at the Cisco Junior College. When she graduated she became charge nurse on the night shift at Stephens Memorial Hospital for 30 years. Berna then retired and enjoyed family and friends. 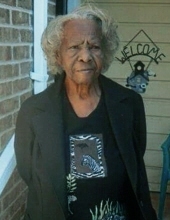 She was a member at Williamson Chapel CME Church, as well as an usher for over 30 years. Berna moved to Abilene and then joined Antioch CME Church. She was preceded in death by her parents, Jab and Maud Davis, husband, Henry Tate Sr., sister, Faye Williams, daughter, Mary Tate, son, Henry (Junebug) Tate Jr., only niece, Gwendolyn Cooper Jackson, only daughter-in-law, Edna Jean Stiggers, Great granddaughters; Mylliah Menyan Royals and Karen L. Mapps. She is survived by daughters; Lynda Williams and husband Abraham of Abilene, Marsha Alexander of Abilene, son, Billy Ray Stiggers Sr., grandchildren; Edith, Debbie, Elaine, Billy Ray Jr., Donna, Rodney, Shannon, David (Bubba) A’Mard (Perky), Misti, Kelly, Jerome, Mellani and Marcus and a host of great and great nieces and nephews, grandchildren and cousins. Our matriot will truly be blessed. Family will welcome family and friends. "Email Address" would like to share the life celebration of Bernistein Juanita Tate. Click on the "link" to go to share a favorite memory or leave a condolence message for the family.